We stood on Pigeon Hill looking out over the dunes in the direction of Heritage Landing and the Muskegon Country Club. Both sites are well-known for their fireworks. This time, because of Michigan’s liberalized fireworks laws, there were sounds and sights all around us, even coming from Pere Marquette Beach. At least one display was happening at the site of our infamous Sky Lantern Incident. The light from the fireworks surely lit up the broken body of our little friend high up in the Coast Guard tree. As we watched the fireworks, I thought of our little lantern friends, whose only crime was wanting to be free. To ride high and free in the sky as they were meant to. I tried to put this thought out of my mind. The last time I tried to free them had not gone so well. But try as I might, I could not cast out the thought. I even told myself that surely on 4th of July, with the rocket’s red glare and bombs bursting in air, there was no way to get into trouble. And so I quickly walked home where some of them waited my return. I chose four of the sturdiest and best looking lanterns I could find. One yellow, one white, one red, and one green. A fine-looking group they were, too. I returned to the fireworks watchers with my prizes. When I arrived, I could tell they had mixed feelings about this venture. No one would make eye-contact with me. After all, they had been party to our last effort, which hadn’t exactly worked as planned. But my new-found enthusiasm was at least somewhat contagious. I quickly recruited the most adventurous of the group (Ardis). The others held back, showing various degrees of fear and fascination on their faces. 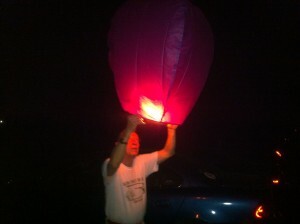 Ardis calmly held our pretty lantern in place while I lit the little square at the base. Her only trace of fear showing when she wondered aloud if the lantern’s surface would retain her fingerprints. Soon enough we had fire and a little smoke rising up inside the lantern. She said it was getting hot, but she held on anyway. Every few seconds we checked to see if we had positive buoyancy. Then, proud lantern midwife that she was, she announced that it was time. I held the lower rim while Ardis released the balloon. Yes! It was ready. At this point, it occurred to me to wonder about the wind. Last time, he had vexed us beyond all reason. This time, I felt nothing. No wind. Perhaps he was in pursuit of other victims. Perhaps he didn’t like the sound of all the explosions. It didn’t matter. This time, our launch would be without the demon antics of our evil friend. 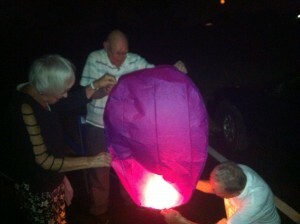 Eagerly, I gently lifted and released the rim of the lantern. Slowly, ever so slowly, it moved away from me. Then it seemed to lose a little altitude as it drifted in the direction of the Harbour Towne Condos. Quickly sighting up the lantern, I saw that at its present speed and course, it would ever so gently drift into two large pine trees. Alas! How could this happen again? It was a calm night. Conditions were ideal. Nothing should have gone wrong. But then, miraculously, the lantern began to lift. It lifted and lifted until the tree no longer posed a threat. Our baby was airborne and free. What a sight! At this point, our fearful friends were heard to comment on the grace and beauty of our lantern. Up and up it floated. A magnificent sight by all accounts. The accolades were unanimous. That was when it occurred to me that this needn’t be a solitary journey. Three more lanterns stood in readiness. I turned to ready the second lantern. I was surprised my action was not met with cries of joy and other expressions of unconstrained enthusiasm. Instead, they were holding back. They wanted to see what happened to our pioneer before they were willing to trust. How could they hold back? Didn’t they see what I saw? Did they not believe? As I paused, wondering if I could generate any enthusiasm for a second launch, I heard a lot of calculating and figuring. I heard things like, “It looks like the wind is moving in a safe direction.” “Probably the light will go out long before it ever lands.” “The light only seems to burn for about 5 minutes.” “We should have timed it to be sure.” “People probably didn’t even notice us with all the other fireworks going on.” I saw the fears and the doubts begin to subside, although they lingered until the lantern flickered out of sight. Slowly, I could feel the sense of pride emanating from our group. That is when I knew a second launch was going to happen. This time, Jim joined Ardis and me. He helped Ardis steady the lantern as I made fire down below. Jim moved several times up and down and around the lantern to observe all aspects of the operation and making mental notes on everything he saw. I could see the gleam in his eyes. I have always been able to recognize talent and management potential. I resolved right then that the next lantern launch was to be his. This time, everyone knew the playbook. The fire burned nicely. The lantern inflated nicely. We had to puff out the sides a little, but otherwise it was going well. It was T-minus 10 seconds, and all systems were green. Then, like members of a synchronized swimming team, we flowed and floated around the lantern as it powered up for liftoff. And a magnificent liftoff it was, too. The wind took it back toward the trees, just as before, but this time, we had held it a little longer, and so it rose faster. The trees were never even a possibility. We complimented each other on our excellent launch techniques and on the wonderful sight as this lantern joined his sister in the sky. Then, suddenly, someone sighted a lantern in a place it should not have been. Over near the Muskegon Country Club. We watched, wondering how our baby could have made it so far. Then we realized the truth. They also had Sky Lanterns. And they had launched one. Although I felt a moment of disappointment at no longer being unique, it was quickly replaced by relief from knowing there were other conspirators doing the same thing. Did they have the same experiences? Had they nearly set the Country Club on fire? Had they narrowly missed the trees? Maybe they spotted our lanterns and drew the courage necessary to make their own launch. The sky was a big place. They were welcome there too. A thought occurred to me. It was motivated, I am sure by our nearly disastrous experiences the other night. What if the police saw the lanterns rising up from Harbour Towne and the lanterns rising up from the Country Club at the same time? Which ones would they go for? I feared we Harbour Townies would become examples of our justice system long before the Country Clubbers. But when I looked up again, I reminded myself of the near-perfect launches. Nothing could stop us now. This time, I wanted to make sure we had photos (having been criticized for not having any the first time). Jim required a little more instruction because of the child-proof device on the lighter that has thwarted more adults than children. But he quickly mastered the complex mechanism and made fire. This time, Dad came forward to help. I was pleased. A trained engineer is always a welcome addition in any high-risk endeavor involving fire. Dad watched carefully, like the professional manager he is, leaving the details to other members of his team. This time the launch was flawless. I was busy taking pictures to mark the moment. Ardis was still worried about leaving fingerprints, but I told her that didn’t matter any more because there would be a picture of her doing the deed on the internet within a day. With such evidence, no one needed fingerprints. And no denials were possible. And so went the fourth launch. Absolutely flawless. With a team like this, the Russians would never have beat us in the Space Race. As we sat around afterwards, basking in the glow of our achievement, it was a glorious feeling compared to our first attempt. The first attempt had left us broken and bitter. Defeated by the wind at every turn. Forced to head home carrying the extra lanterns we had not dared to launch. But tonight was our night. We were amazing. Success! I was a witness to this wonderous event. But, unfortunately, reluctant to have my finger prints found just in case we are arrested, I did not participate in this great adventure. Next time I will join our brave friends. Throw caution to the wind. However, I may wear gloves. It was indeed a glorious and festive occasion on Pigeon Hill, inscribed for eternity by the bard of Harbour Towne! Hooray for The Bard…….Sure more adventures to be chronicled…..
Delightful. A drug-and-alcohol-free antidote to the news of the day. For your next adventure, try radio-controlled sailboats in your harbor. Steve – the good remote sailboats have about a 36″-48″ mast so the height should scare of the swans and Canada Geese. They are great fun and I have often wanted to own one myself. I have sailed them and they are quite easy to handle. There are large racing clubs that do this in and near Grand Rapids certain nights of every summer week. Ken – let’s go watch them some time. I would love to see them in action. So where are the photos? What a perfect compliment to a beautiful story! If everyone lit just one little candle……. We could set this whole town on fire! 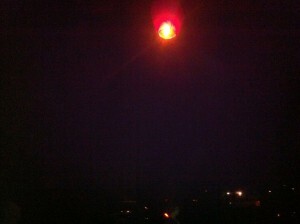 Sky lanterns sound like fun and contrary to those college assignments, so’s writing! I’m having as much fun reading them as you obviously are writing them…thank you Steve! Ace Lantern Launcher Jim reported on a major launch scheduled for Grand Haven. Aproximately 70 lanterns are scheduled to be launched around 930pm on Saturday, August 4th, near the Kirby Grill.